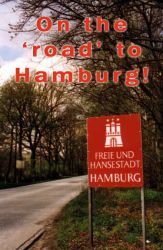 For all you Hamburg newbies out there! In this post you will find my personal tips on how to get the most out of one or two days exploring Hamburg! Start the day by experiencing Hamburg from an unusual perspective by taking a boat tour through the harbour (Germany’s largest port). Go directly to the Harbour to get a boat. Don’t let yourself be intimidated by the many different boats for tourists, the itinerary is the same for all and usually lasts 2 hours! Do, however, watch out for impostors; a tour should cost you no more than 20€! 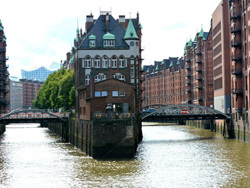 If you love live music, you will certainly enjoy a stay in Hamburg! 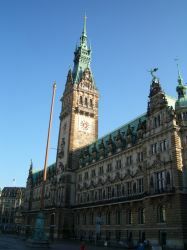 Naturally, big cities are always more frequently visited by musicians on tour, and the north German metropolis is one of the cities in Germany where they usually stop. But there are also some things that are special about Hamburg’s music culture and I’d like to share some of my experiences here. As far as genres are concerned, there is really something for every taste. Of course, Hamburg is famous as a host to several award-winning musicals and it’s actually the third biggest musical location in the world, only outdone by New York and London. As for classical music, you have the Music hall Hamburg (Laeiszhalle) where both the Philharmoniker Hamburg and the North German Radio Symphony Orchestra play regularly. The Elbphilharmonie Hamburg is still under construction at the time of writing. This massive concert hall located at the harbour in central Hamburg calls itself “Europe’s largest cultural construction site”. Class finished at 1 pm on 1st August and the weather was very nice. 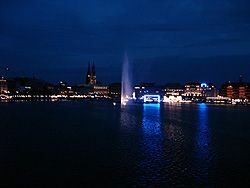 We decided (since it was the end of the week and legal in Germany) to buy a beer and sit in the town centre – overlooking the Binenalster. I left to go pick up some keys from a friend and whilst I was gone the local news team took my seat and interviewed my German course classmates on the weather in Hamburg. Normally summers in Hamburg are beautiful. Today was no exception but the last week has been a little less than perfect. Hear what my friend has to say 27 seconds (51 if counting down) into the video below. Next to him is another guy from my class who started this week. Here is a short postcard describing my time here in Hamburg. Using the German that I have learnt in a week and a half I think I have got a typical day for me covered nicely 🙂 I would also like to apologise for those reading this with an advanced level of German but hopefully you are still a little impressed! It´s now Sunday; my first week of learning German in Hamburg and most of the weekend is over and I am actually looking forward to going back to school tomorrow! I was surprised with how much I could learn in my first week but also how quickly I could make some great friends. 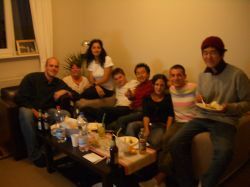 The class I am in contains a really nice group of people and Friday night we all went to a house party of a Swedish-Iranian women who lives in Hamburg with her German boyfriend. We met at Barmbek subway and didn´t have the best directions, but after asking German taxi drivers for the way… in German… we found it very quickly! There were exactly (she´s counted) 92 steps to her aparment in an old German style building, so the first drink of the night was very welcome! Well for some reason I was a little nervous on my short trip to school on Monday morning; maybe it was the fact that it was early, I hadn´t had any coffee and was still recovering a little from Saturday night; maybe I was reminiscing the last first day I had at school, who knows – but I found out quickly that I needn´t have been. The street (that the school is on) was much busier now it was a weekday and the cafes were full with people getting a quick fix before they start work – or in my case school! I thought it best to go straight in and in doing so was met with glances and many smiles from fellow international students. I was then greeted by one of the school´s directors who told me what class I was in and the times I will be in it: 8:50 – 13:00 with a 15 minute break in between. The school owns buildings of each side of the street and a bookstore also. My classes were opposite the bookstore on the third floor. There’s a lift, but since I am in training (ahem, cough, cough) for the next season of volleyball I thought I´d run up the stairs instead. Well I´m here safe and sound and all is good. 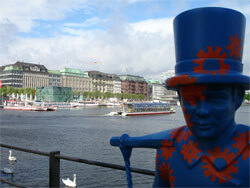 I flew Ryanair to Hamburg Lubeck – arriving Saturday and the bus to the city centre could not have been simpler. It was 8 Euros and coincides with the flights, so if your plane is late it will wait – which is reassuring. It took about an hour and I had the back seat to myself, so that was nice! I was met by my girlfriend at Hamburg´s main bus station but if someone´s not meeting you (if you are thinking of coming) then don´t worry. You are right next to the metro and can easily get around for just 1 Euro 30 cents. Hamburg´s metro is not like London´s with barriers everywhere. You could get around a lot and not have your ticket checked, but I know I couldn´t go ticketless. If you are caught the fine is severe! That reminds me – I must figure out how to buy a week´s ticket. I´m sure it´s not complicated. All about the grammar, it is. Well it’s about time that I was properly taught German. My only experience of it before was from a not very nice Scottish teacher (with a thick and confusing accent) in an English classroom. My sisters used to also help me with my homework, so it was probably the subject as school I knew least about. It is Friday and I have started to wrap things up at work, ready for my 2 week break in the excellent port city (Hafenstadt) of Hamburg. My German friend is on an internship at the Trend Buero in Hamburg so why not take the opportunity to visit her and learn German whilst I am there?! I have already completed a level test, which really pointed out my non-existent knowledge of German grammar. The problem I believe is that I have no decent concept of English grammar and it is hard to change my mind on what I believe is the only way to construct sentences. I am sure you are aware but in German you can’t simply translate sentences as they are written in English… if only it were that simple! 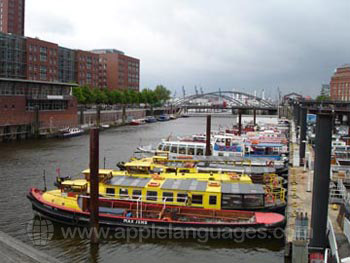 A German course in Hamburg – a very curious experience! Tell anyone that you’re visiting Hamburg, and chances are that they will say something like ‘Ah, the Reeperbahn!’ often accompanied with a smile and a wink! However, although Hamburg’s infamous red light district is undoubtedly an important part of Hamburg’s character (actively promoted by the tourist board) there is so much more to see and do in this wonderful city! Getting to Hamburg is easy. The low cost airlines generally fly to Lubeck which is an hour’s drive from Hamburg by shuttle bus (or approximately half that time if you get a lift as I did in a big BMW and take the autobahn!). 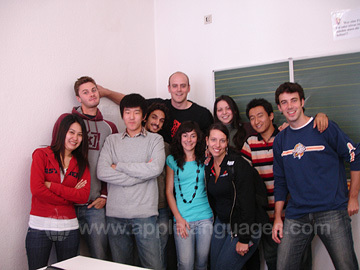 You can also see pictures and information on the German language school in Hamburg I visited.